Ever seen the movie Heidi? You know, that terrible Shirley Temple movie from the 1930s that was made into an even worse animated movie in the 1980s? Apparently some human being thought it would be a great idea to remake Heidi by sticking a bunch of dogs in front of a green screen. The most freakish thing about this is the way they got these canine mouths to move. As the description on the website puts it these are “fully mouth-articulated dogs”which sounds like a description you might find on the package of a canine love doll. The infomercial for this production cites the names of a lot of actors I never heard of in a way that makes me think I should have heard of them. The most famous is probably Angela Lansbury, best known for playing Jessica Fletcher in Murder, She Wrote. Conspicuously absent in the names of celebrities mentioned in the TV commercial is Steve Guttenberg, who is listed on the website as being one of the stars in Heidi 4 Paws. Now that Steve Guttenberg, star of the Police Academy films, has appeared in a talking dog movie, the cinematic art form has at long last reached it apotheosis. I don’t know what creeps me out more- the low budget talking dog movie or that picture of Steve Guttenberg. The LA Times review is funny. Maybe I’m jaded and expect more from SFX these days. It sounds like a cute story, but I’m just not sure if kids these days will buy into it and enjoy it. 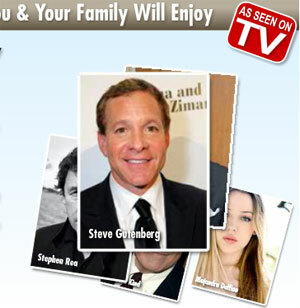 Steve Guttenberg’s hairpiece is an As Seen On Tv product.